Technology may have advanced profoundly, but let’s face it: a flashlight is still pretty much a necessity even now. 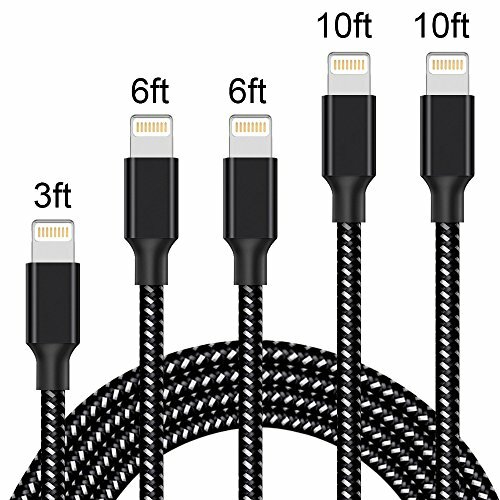 However, with more and more technical advancements being employed to an otherwise simple light bearing device, this gadget is getting pricey. We reckon the minimum budget for a decent flashlight these days around the ball park of $50. Yes, you can find quite a few options for under $20 but the quality and performance may be questionable. Therefore spending a few extra dollars wouldn’t be a bad idea considering the durability and added quality they carry. 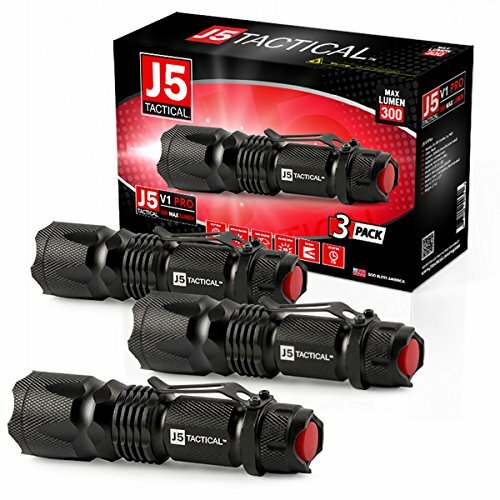 The J5 Tactical flashlight weighs in on the Amazon market at around the same rate as the GT Road. It comes equipped with some highly impressive functions. It is designed for heavy duty, compact in size and tough against the elements. It comes in as a huge asset to have on your tough terrain camping and hunting trips. The main features of this model are an intelligent lay out 3 modes – high, low and strobe which prepare you for virtually any situation you’re in. The Super bright function maxes out at 300 lumens from an LED and has the capacity to light up anything within a range of 600 feet. Considering these features, the price you have to pay should be considered pretty cheap. The battery is a single AA but you can also use a 14500 rechargeable for prolonged usage. But perhaps the best thing about the J5 Tactical is just how confident its manufacturers are with their product. If you happen to not be completely satisfied with your flashlight, you are entitled to a full replacement or refund of your purchase. 100% is the minimum satisfaction they will have for their customers. No prizes for guessing why this one made it on our list. 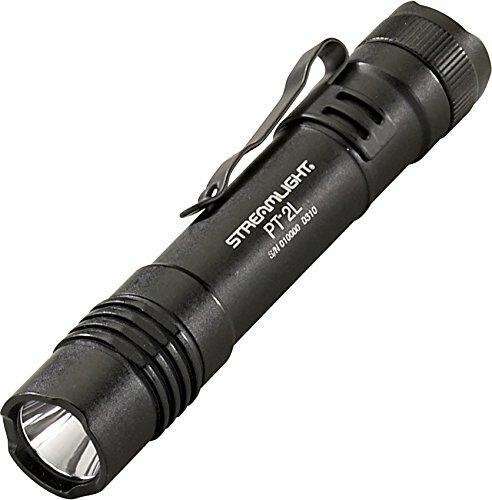 The Streamlight is another one that we found delivers exceptionally on a budget when you pay attention to the specs. This light comes equipped with C4 LED technology which boasts a simply staggering 50,000 hour lifespan. It is also waterproof to a meter of water for up to half an hour courtesy of an IPX7 rated design. Power comes from two CR123A lithium batteries which are included in the package. However you might encounter some problems at the beginning of owning one like with the 600 lumen output for instance which can reduce drastically after a month or so if the flashlight is used extensively. There have also been some complaints about how Streamlight handles its warranty conditions. That said, the little niggles you may encounter at first can be easily solved if you know what you’re doing. The Anker Bolder LC90 is another neat piece of kit we managed to find that agreed with our budget. 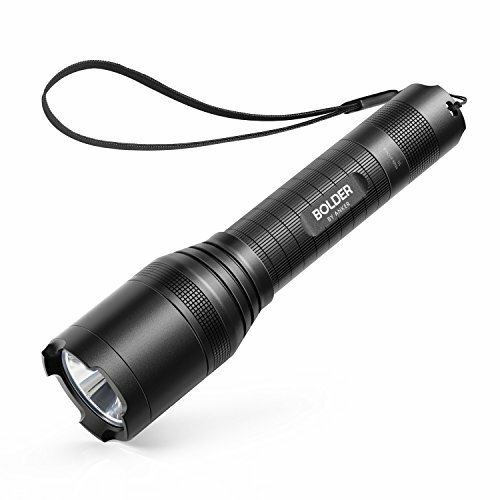 Its super bright function is a 900-lumen Cree LED that can reach objects nearly a thousand feet away. The adaptable modes are five ranging from high, medium, low, strobe and SOS. Zooming capability affords a wide and narrow beam. The Anker is constructed out of aluminum which makes it very durable and is IP65-rated in water resistance as well as shock resistant. The design is compact and pocket friendly and can be used in a heavy downpour. It is also neat enough that the LC90 also has a stand-on-end lamp for an emergency. Additional features you get are a 18650 3350 mAh rechargeable battery, an 18 month warranty service, a wrist strap, and a micro USB cable. The Anker promises to be very useful in the great outdoors but is certainly no half wit at taking care of indoor functions either. The Onson Outdoor Tactical Flashlight just about made it onto our list. Even so, it is good value having a whole year’s worth of warranty. It’s also the best cheap flashlight on our list. Lighting modes adjust between high, medium, low, strobe and SOS and the focusing range of the zoom function is highly adjustable. The Onson is also water resistant and anti-abrasive so it does not give in easily to wear and tear. Therefore, you do not have to watch over it like a baby. It is another candidate that is ideal for outdoor activities aided by its skid-proof design. The body is made from tough aluminum alloy. It comes with a package that includes 1 rechargeable lithium ion battery and 1 lithium battery charger. The Onson uses a reliable CREE XML T6 LED chip that can achieve a maximum brightness of 900 lumens. When scoping through all the possible options, it is important to consider the type of environment in which you may frequently have to use your flashlight. The simplest categories to begin with are indoors and outdoors. You can still go for a budget as low as $20 for a good flashlight. Also pay attention to details on the flashlights themselves. For instance, battery life and the type of battery being used. We would all prefer the flashlight that can work harder for longer and also to have frequent access to battery replacement. Other factors like lumen strength and adjustability will help you asses how capable a flashlight is with how much of beam it can produce along with variations. If you are on a budget, be sure to maximize the return on your purchase by selecting flashlight that is respectably and built with the best available materials. Accidents can happen after all and it will be reassuring to know that your flashlight can deal with most of them.